Christina Hachikian is the executive director of the Rustandy Center for Social Sector Innovation at the University of Chicago Booth School of Business. She leads the center’s global work as the hub for people solving complex social and environmental problems. In particular, she is responsible for strategy and direction, as well as resource development and partnerships. 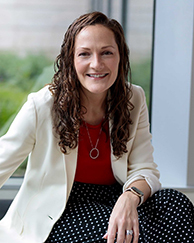 She is also an Adjunct Associate Professor at Booth, and teaches courses on scaling social innovation and on social enterprise strategy, as well as serving as a coach for the school’s Social New Venture Challenge. Prior to joining Booth, she was vice president and head of investor relations and corporate development for Cole Taylor Bank. In this role, Hachikian was responsible for building relationships within the investment community and crafting financial communications, as well as managing projects such as corporate capital actions and strategic planning. Prior to Cole Taylor, Hachikian was an assistant vice president at ShoreBank (now Urban Partnership Bank), a triple-bottom line community development bank. There she was responsible for managing projects including growth strategy, capital raising initiatives, and operational efficiencies. She held several other related positions at ShoreBank during her seven year tenure. Hachikian also has served as a research and planning analyst for Raytheon Company, directing research projects. Hachikian holds an MBA from the University of Chicago Booth School of Business, with a focus on strategic management and managerial & organizational behavior. She also earned an AB in public policy from the University of Chicago. In her spare time, she works with a Westside early education center, VOCEL, and is passionate about early childhood education access. She is inspired every day by her two children to support this issue.